Today was one of those chilly fall days in which a handknit sweater would have been the perfect thing to wear. Unfortunately, mine is stalled. I wanted nothing more to come home and find it finished, folded neatly in my closet, but I have no such luck. My observation of the fall weather was only accentuated by the field trip I took today. For one of my classes, I had to visit a fish farm. During the entire drive to and from the farm, all I could see was the fall colours flashing by. As if that wasn’t enough, I came home and made this. 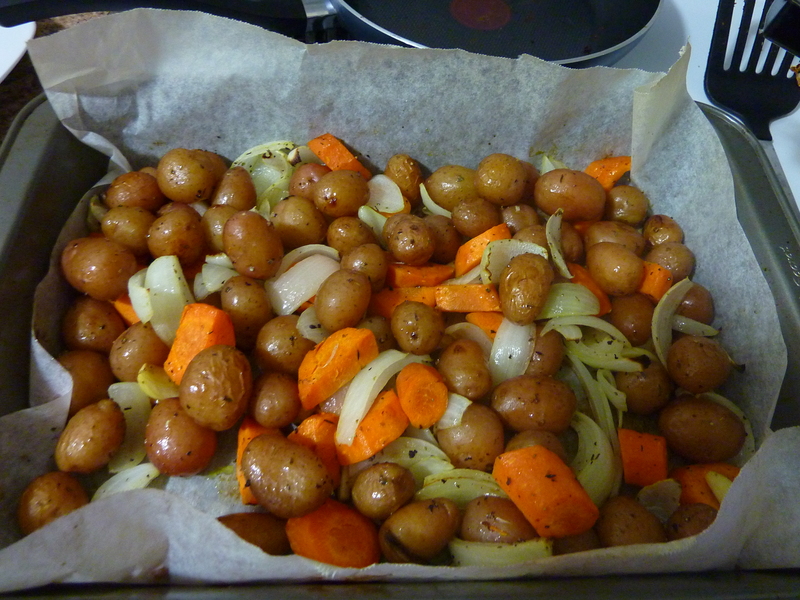 Delicious roasted vegetables. They tasted amazing, and I clearly made a ton, so I have lots of leftovers. It definitely made the house smell like fall. I’m thinking that, despite my fall fever, the knitting progress may be a little slower in the coming weeks as midterms approach. I can’t believe that they are already (almost) here. I swear I just moved yesterday! Alas, back to the books, before I do some knitting and turn in for the night. Wednesdays tend to tire me out, with 7 hours of class. By tomorrow I hope to have some sock or sweater progress to show for myself!